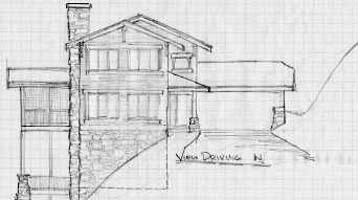 The clients loved a craftsman style house plan and wanted help fitting it on an extremely steep river front lot. The property was much more steep than they described. It would have cost a fortune to excavate a house down closer to the water. And the driving access would have been impossible. So I took measurements to plan something that would fit and they could afford. Now, I realize that the prairie style was intended for the flat lands. But I wanted to make my clients happy, so I focused on a home designed to fit this property that had enough of a craftsman look that they would like it. The plan was extremely narrow to fit the very steep slope. This would also allow more rooms to have windows facing the river. It also allowed room for a carport with easy access into the house. This home was not built, but I included it here to show that there are many options for mountain homes. Some people have seen this sketch and asked me about the possibility of making their idea work.